Major signals of on an ongoing and inexorable global warming trend continued to be apparent during January of 2018, according to NASA records. The first month of this year saw global temperatures in the range of 0.78 degrees Celsius above NASA’s 20th Century baseline — or about 1 C warmer than 1880s averages when NASA record-keeping began. Despite the influence of La Nina — which during 2018 is stronger than a similar 2017 Pacific Ocean cooling event — January was the 5th hottest such month in all of the 138 year global climate record. According to NASA, all of the top five hottest Januaries ever recorded have occurred since 2007, with four of those five occurring during the last five years. Warm temperature departures for the month were most extreme over the Arctic, over western North America, and through North and Western Europe. This outlier warmth contributed to record low sea ice extent measures in the Arctic and helped to rapidly expand drought conditions across the U.S. In the Southern Hemisphere, Antarctica — recently seeing a series of glacial calving events in the west which hint at a quickening pulse of ice entering the world’s rising oceans — saw an abnormally warm austral summer month. Meanwhile, Australia experienced its own third hottest January even as concerns over renewed mass coral bleaching across the Great Barrier Reef were again on the rise. During La Nina, movement of warm air and water toward the polar region is enhanced. To this point, global sea ice extent measures are again in record low ranges even after receiving a serious hammering during the winter of 2017. In January, record to near record polar warmth helped to drive a rapid fall in global sea ice extent to today’s record low values in the range of 16 million square kilometers. Record low sea ice coverage is a climate change amplifier in that it uncovers dark ocean surfaces that capture more of the sun’s rays than white, reflective ice. In addition, open ocean ventilates more heat into the polar atmosphere. Heat that would typically be sequestered beneath the ice. This warming amplification (polar amplification) can also have an impact on the polar circulation of the Jet Stream — causing it to meander more which results in increasing instances of extreme weather (hot, cold, wet, dry, stormy) in the middle latitudes. Over the coming months, we should expect some continued stress to both Arctic and Antarctic sea ice — with the caveat being that cloudier late springs and early summers have tended to retard warm season ice loss during recent years in the Northern Hemisphere. That said, continued movement into record low ranges for the Arctic hint that rapid advance of melt during winter may eventually translate to summer. The primary driver of these serious changes to the global environment is continued fossil fuel burning. And with atmospheric CO2 likely to hit between 411 and 412 parts per million this year (with CO2e ranging toward 493 ppm adding in all greenhouse gasses) the amount of warming already being locked in is starting to look quite dangerous in a number respects. That said, damage can still be greatly limited if the world works to rapidly transition toward renewable energy and keeps harmful fuels where they belong — in the ground. The world is now well on its way to seeing back-to-back hottest years on record. Unprecedented and amoral burning of fossil fuels is now forcing the global temperature average to rise into the range of 1 degree Celsius above 1880s averages — or halfway to a catastrophic 2 C warming. A level at which scientists believe many climate change tipping points will be irrevocably crossed. According to NASA GISS, global temperatures for the June, July and August period of 2015 were 0.78 degrees Celsius (C) above the 20th Century benchmark or about 0.98 C above 1880s averages — when global record keeping began. The previous hottest three month period occurred during 1998 at +0.72 C. Notably, June, July and August were the hottest three months for 1998. But for 2015, December, January and February came in at +0.83 C and March, April and May came in at +0.81 C. These extreme temperature departures, when combined with the June, July and August readings, now put 2015 at +0.80 C above average for its first 9 months — or well above any previous record-breaking year. A significant single year margin above the previous hottest year — 2014 — of +0.05 C (a single year rate of warming about 150 times the average rate of warming at the end of the last ice age). August itself came in at +0.81 C above NASA’s 20th Century benchmark average. This departure marked the second hottest August reading in the 135 year temperature record, falling just 0.01 C behind the previous hottest August reading hit just last year (2014). Geographic distribution of temperature anomalies continue to show the signatures of both a strong El Nino and a growing climate change related signal. The August El Nino signature was particularly strong in the Eastern and Central Equatorial Pacific with 1-4 degree Celsius hotter than normal temperature departures dominating the region. This heat extended throughout the anomalous ‘Hot Blob’ or ‘Ridiculously Resilient Ridge’ zone that has continued to be dominated by extreme sea surface temperature departures with 1-4 degree Celsius above normal temperatures pervading. Such extreme heat was linked to equally extreme drought and wildfire conditions dominating broad sections of the North American west throughout the month. Conditions that, for many areas, have been endemic for many months running. Anomalous heat also dominated the land masses of South America, Europe, South Africa, and the Lake Baikal region of Russia. These areas experienced some or all of the following: extreme drought, wildfires, water resource stresses, extreme heat-related weather, and heatwaves. A cool pool in the Northern Atlantic between England and Newfoundland remained a prominent feature. This cool region is associated with climate change related conditions that are now in the process of weakening both the Gulf Stream and North Atlantic bottom water formation. It’s a set of conditions that weakens equator to mid-latitude heat transport and intensifies the North Atlantic storm track. An upshot of human-forced warming that has been predicted for decades by even the most rudimentary of global climate models but that now appears to be cropping up a bit earlier than previously expected (see World Ocean Heartbeat Fading?). Persistent troughs over Eastern North America and Western Russia also generated their own cool pools. Meanwhile, surface temperatures over Central Antarctica dipped into cooler values — likely associated with intensification of storm systems in the Southern Ocean. NASA’s zonal anomalies map also displayed a strong El Nino signature with the global equatorial zone showing the highest above average temperature departures (in the range of +1.3 degrees Celsius). This extreme heat maintained throughout the Northern Hemisphere mid-latitudes all the way to 60 North before falling off to between +0.2 to +0.4 C near the pole. Progressing southward, anomalies steadily declined, even dipping into a range of 0 to -0.9 C anomalies in the region of 75 to 90 South. Consistent high temperature departures near the Equator, as we see now, tend to aid both in storm track intensification and a general flattening of the Jet Stream. Though these conditions have not yet dominated in the Northeastern Pacific, a continuation of the August temperature departure pattern and related strong El Nino will likely both intensify the Northeastern Pacific and North Atlantic storm tracks as Fall progresses. Such a shift, however, would have to be very extreme to bust the 3 year running California Drought. Overall temperature departures for both August and for the June, July, August period are well outside the range of anything that could be considered normal and are swiftly rising to more and more unsafe and climate destabilizing levels. The emergence of the North Atlantic cool pool is a feature specifically related to storm intensification and regional and global weather destabilization. A feature predicted by global climate models due to human forced warming, related melting of Greenland ice, and the upshot slowing down of critical ocean currents. The recent unprecedented Hot Blob in the Northeastern Pacific was likewise predicted in the scientific research as a result of human forced warming — a feature that, it was warned, could result in much warmer and drier conditions for the North American West Coast. Climate change related heat signatures such as these clearly show in the NASA monitor even as the global measure keeps rising to new and more dangerous extremes. 2012. It may not be the year the world ended. But it will, likely, be the year we came to terms with the eminent and tragic final days of Arctic sea ice. It began innocuously enough. Five years after the record losses seen in 2007, there was some cause for hope of a slower, more gradual decline. Most 2007 records had held with 2011 seeing only a slight drop in the sea ice area measurement. Though it was obvious calls for sea ice recovery were entirely unfounded, there was little reason to suspect another season of violent losses like that seen during 2007. The weather was predicted to be unfavorable for a record melt and, at most, minor losses were expected. What unfolded was a sea ice Armageddon of massive scale. A freakish loss that defied all conventional expectation of weather and climate. For most of the summer, conditions favored a spreading out of the ice sheet. This condition usually enhanced the resiliency of sea ice, keeping the reflective coating over a larger area and, therefore, driving temperatures down. But, this year, it was apparent the sea ice had spread out too much, had grown too thin. A rotten film filled with holes and encircled by an invading mass of warmer winds and seas. An ice screen vulnerable to the assault of sun, wind, and wave in a way that the Arctic sea ice had never been vulnerable. Not in our history, at least. Not in that thin span measuring our frail and short-sighted civilization. The sea ice was waiting. Spread out, beleaguered. Grimly expecting a telling blow. That blow came during late August in the form of a powerful storm. 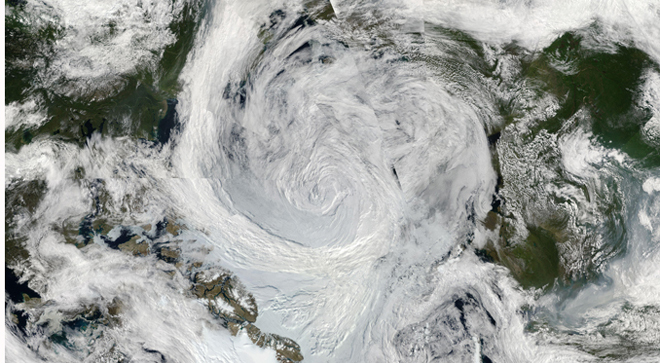 The Great Arctic Cyclone of 2012. Spawning in the burning Siberian Arctic, this storm formed in a region where massive blazes had, only a month before, belched out enough smoke to cover Canada’s valleys, thousands of miles away. Latent heat and moisture had concentrated there, building and building through an unnaturally long and hot summer season. Like a hurricane, its clouds towered, marching out with gathering strength to assault the frail and weakened ice. The giant storm howled, sending 65 mile-per-hour winds through the Chukchi Sea, and aiming its fury strait at the Arctic’s heart. It dug deep from heat and moisture reserves to the south, a source of energy only recently made available by human-caused warming. And it spent that new-found might in a mountainous blow against the desperately weakened ice. 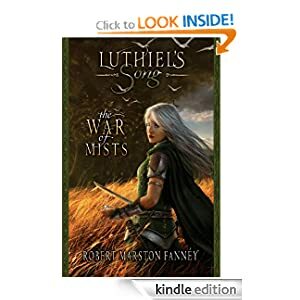 Waves of 6, 8, 12 feet roared over the thinly frozen sea, breaking it into a slurry and mixing it with the warmer surrounding ocean as if in an enormous blender. When The Great Arctic Cyclone of 2012 finally died out somewhere near the North Pole, hundreds of thousands of square miles of sea ice had been churned up, spit out, melted. And, afterward, most of the ice in the vast Chukchi Sea had been cleared away. Melted in the storm’s fury or pushed deep into the high Arctic, driven against that final buttress for northern ice: Greenland. But the story of 2012’s deadly melt was far from over. The now thinned and storm-weakened ice continued its daily decline for more than a month after the ravages of The Great Arctic Cyclone of 2012 abated, finally reaching a state far, far weaker than even the terrible year of 2007. 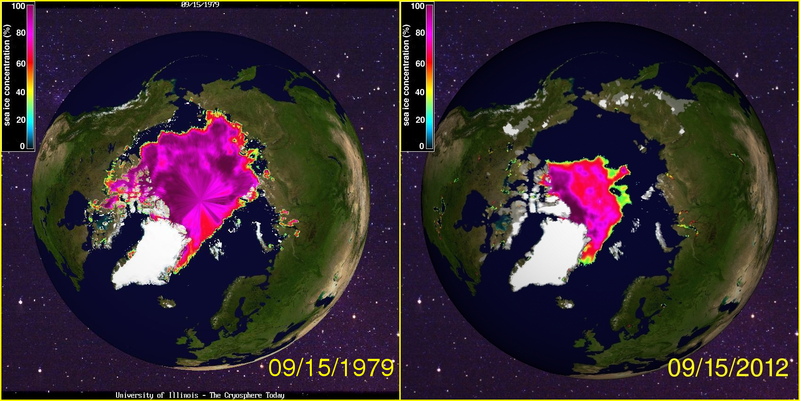 It left the Arctic with about half the ice coverage seen during the 1980s. An ice coverage that is now also far, far thinner. The ice will be gone soon. The only question is how soon. In answering the question of how soon the last small remnant of Arctic sea ice will vanish, victim to the powerful forces our human world has set loose upon it, we should take a look at the numbers, at what we know has come before, and at where the trends are leading. In taking this final remnant of ice into account, we have three measures. They include sea ice extent, sea ice area, and sea ice volume. Each measurement has its own tale to tell and each tale can give us some idea as to when sea ice will finally fail — first at the end of summer, and last for all time and for all seasons. Sea ice extent is a measure of how far the sea ice edge reaches. If we take the border of the continuous outward edge of the polar ice and draw a line around it, all regions within that circle are counted as part of sea ice extent. Extent does not count holes in the ice. So this measurement may include some open water areas behind the extent border. Up until 1979, our best observations for sea ice extent came from reports collected by ships. But even these spotty accounts were enough to show a slow, long-term decline in sea ice since the early 20th Century. What satellite measurements did was make sea ice extent and area measures far more accurate. 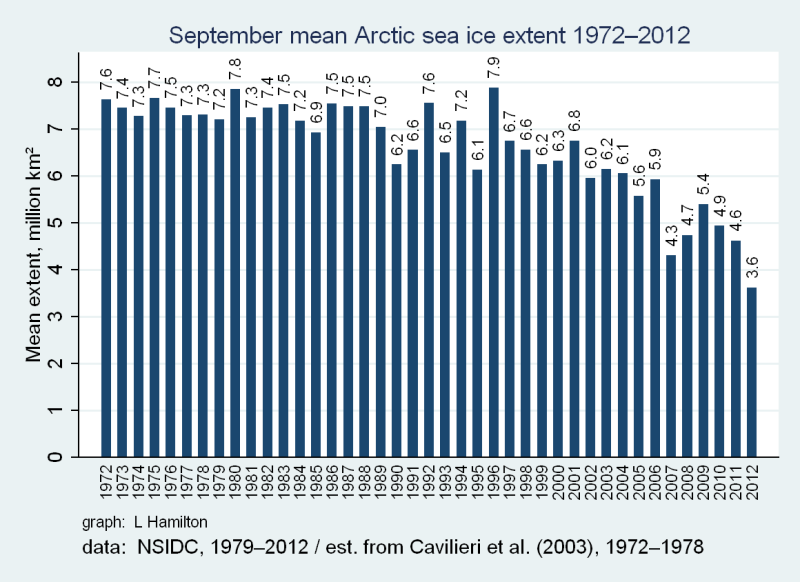 As you can see from the graph, sea ice extent slowly retreated through the 1970s and 1980s. The 1990s showed substantial average losses. But the rate of loss was still relatively slow. Even the early 2000s, when looking at extent measures alone, doesn’t give us any clear indication that we are on the verge of a rapid, violent decline. It is not until the period of 2005-2012 that we begin to get a hint that something devastating is afoot with 2012 putting a final full stop on a period of melt that has resulted in the loss of half the Earth’s northern sea ice extent. A 50% loss of sea ice in so short a period is a devastating reduction in the reach of the world’s frozen regions. If Jack Frost were to serve as a metaphor for the sea ice, we’d say his arms had been cut in half. Sea ice extent gives us our least detailed picture of ice loss. Since it only measures the edge of ice, we don’t really know what’s going on behind the ice margin. And that’s where looking at sea ice area comes into play. 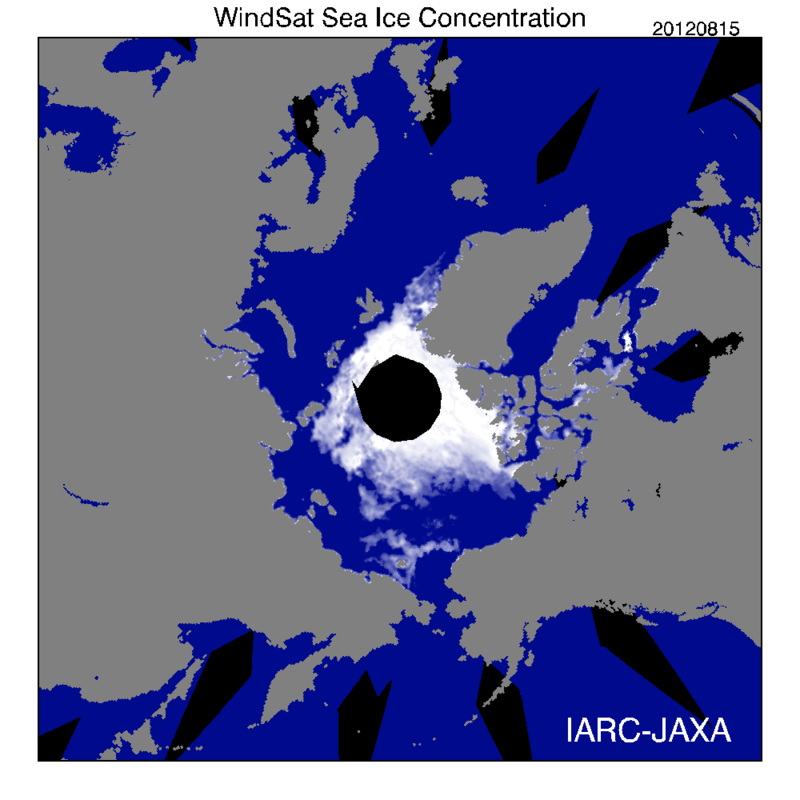 If sea ice extent draws a circle around the ice pack’s leading edge, then sea ice area tries to take into account all the visible surface ice as well as open holes behind the ice pack. Area, therefore, is the total measure of all ice as visible from above. The peaks show maximum annual sea ice area at winter’s end. The dips show the summer sea ice minimum. The red dot is showing today’s measurement. By the numbers, final minimum sea ice area in 1979 was 5.9 million square kilometers. Final minimum sea ice area in 2012 was 2.24 million square kilometers. It is important to note that sea ice area is a more exact measurement than sea ice extent. Taking into account the holes in the ice gives us a more complete picture of the sea ice’s health. And in comparing sea ice area and extent, we can see the actual losses are much greater than the initial sea ice extent measure would have indicated. The tale of sea ice area loss since 1979 is this: a 62% drop in sea ice area since 1979 shows the Arctic ice has been reduced to little more than frozen Swiss Cheese. But the most detailed and devastating measure of sea ice is yet to come: sea ice volume. Just as it was difficult to get an accurate measure of sea ice area and extent before the age of satellites, it has been equally difficult to gain an accurate measure of sea ice volume. That is, until Cryosat data began being used just this year. Over the past few years, however, a sea ice modeling tool known as PIOMAS (Pan-Arctic Ice Ocean Modeling and Assimilation System) has taken data observations from the Arctic (ships, planes, submarines, satellites) and plugged it into a model to get a general sense of total sea ice volume. 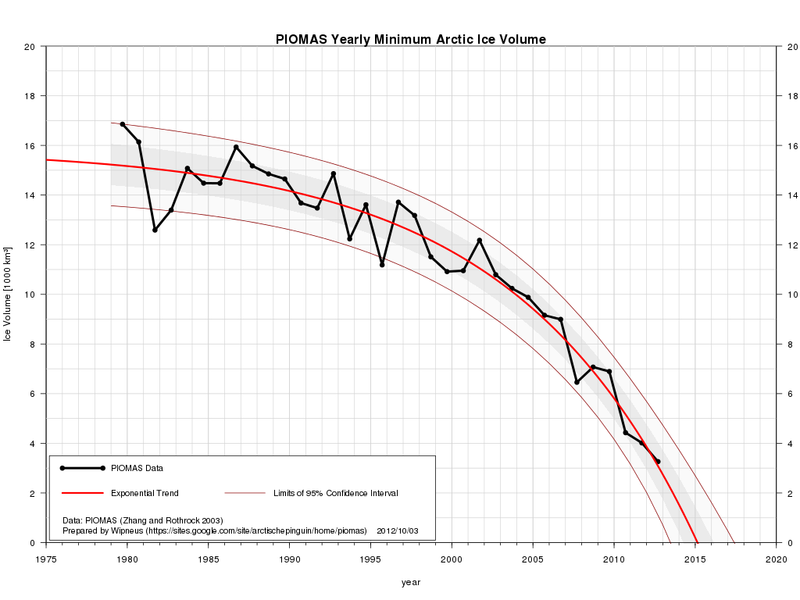 PIOMAS data, until recently, was considered a secondary, less accurate source of Arctic sea ice information. This demotion was due to the fact that PIOMAS was only a model based on direct observations, not a direct observation itself. But the status of PIOMAS changed when an analysis of Cryosat2 data by British scientists validated the PIOMAS findings, proving the model accurate. Cryosat2 used a space-born sensor to plumb the ice and it was these measurements that validated the PIOMAS results. When the PIOMAS results were validated, a ripple of fear passed out through the Arctic sea ice community. The reason for this dread, if you are not a habitual observer of Arctic sea ice, will grow more clear to you as you read further. Sea ice volume is a total measurement of the ice. Its length, its width and its depth. The measure is in cubic kilometers, not the flat squares seen above as from a photograph. In short, volume tells the real story of the Arctic sea ice. And the story is very, very grim. The above image, provided by Larry Hamilton, takes collected PIOMAS data, and plugs it into a simple graph. If a picture paints a thousand words, then this one paints a million. For my part, I will do my best to summarize. What the PIOMAS data in the graph reveals is that the gradual declines seen in Arctic sea ice area and extent measures were hiding a much larger trend. A trend of substantial ice loss that has been ongoing since 1979. The 1980s was not the stable decade area and extent would indicate. The 90s showed a period of rather rapid ice loss. And the 21rst century showed a tremendous and increasing pace of decline. Any child knows that when ice melts in a glass, it grows thin first, then loses most of its surface at the end if its melt. 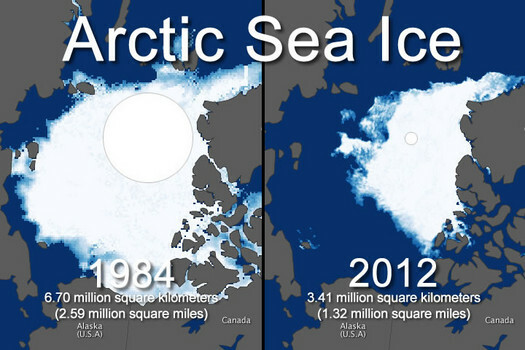 This process is what appears to have happened with Arctic sea ice at the scale of giants. Since volume is the most exact measurement, total losses of sea ice in the Arctic are even worse than the satellite pictures would indicate. Much worse, in fact. An 80% loss of sea ice volume since 1979 is a tremendous decline by any account. It shows the ice has grown very, very thin. And more importantly, it shows that we are very close to a time when no sea ice will remain in the Arctic by end of summer. How soon? How soon can we expect for there to be no ice left in the Arctic at the end of summer? And can we expect a total loss of Arctic sea ice at all times of the year within our lifetime? Will the polar sea ice become little more than a myth told at Christmas time? 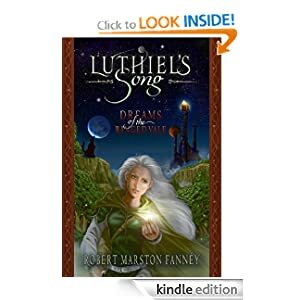 Will the siren song of polar bears and other Arctic creatures, long vanished from the Earth, haunt us in our dreams or the dreams of our children? The tragic answers to these questions have become ever more clear just this year. The saga of unpredictable violence and melt that occurred during the summer of 2012 combined with Cryosat2 sea ice volume discoveries to paint a picture of Arctic sea ice vanishing far faster than previous models and scientific expectations forecast. In the past, the convention of scientists at the IPCC had expected a nearly ice-free Arctic by the end of this century. That ‘past’ was as near back as 2007. Now, those expectations are shattered. Now, you would be hard-pressed to find a single climate scientist who predicts the Arctic summer sea ice will last more than 40 years. A new consensus for ice-free conditions seems to be forming around the 10-20 year mark. And a growing number of scientists are predicting ice-free Arctic seas within the next 3-10 years. This is the radical change that falls out of the consequences of one freakish year. But, back to our original question: how soon could it happen? At the absolute worst case? One year. Yes. There is a slight but not insignificant chance that all the sea ice could melt away next summer. This event isn’t likely but it is possible if weather conditions like those occurring during 2007 repeat. During that year, 2,500 cubic kilometers of sea ice volume melted away. 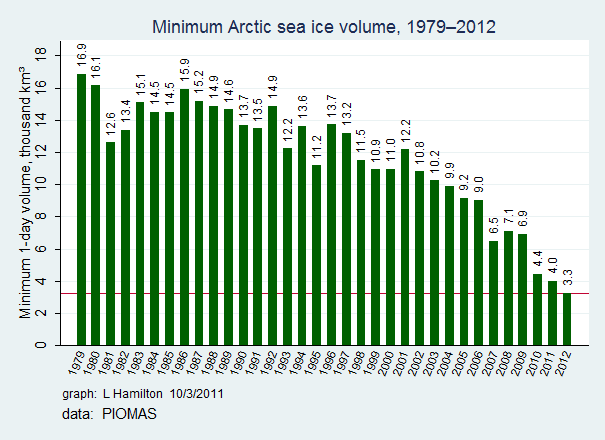 And this is very close to the present sea ice volume minimum of 3,300 cubic kilometers remaining at the end of 2012. So it is possible, though not likely, that there will be no sea ice left by the end of summer next year. The possibility is low, but not so low as to discount entirely. For sake of argument, we’ll say a 10% chance. 10% isn’t too likely, but it’s enough to keep a climate eye on the Arctic just in case. Now let’s try to answer the question a little more accurately. Let’s rephrase it and ask how soon is it reasonably likely for summer sea ice to be gone? What’s the best date given current trends? The answer to this question is actually rather easy. We can track current trends by looking at sea ice volume trends and extrapolating those trends over time. And what we find, doing the math, is that if current melt trends continue, the summer sea ice is most likely to have melted out of the Arctic within the next 4-6 years. We can find this number by averaging sea ice volume declines year-over-year since 2007. When we do this, we find that about 640 cubic kilometers are lost each year, on average. Multiplying this figure by 5 gives us 3,200 cubic kilometers of sea ice remaining, just 100 cubic kilometers below the current minimum. Since past trends aren’t entirely predictive of future results, we can’t be certain that this event will happen accordingly. 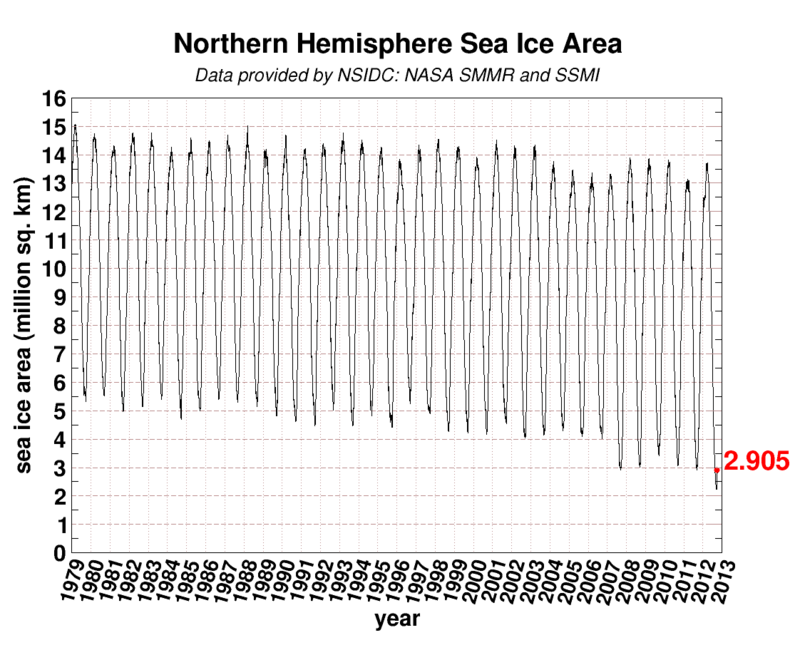 An anomalous year like 2007 could wipe out all the sea ice next year or the year after. The sea ice could have been so damaged from 2012’s freak season that each year following will result in more and more melt, a kind of amplifying death spiral until there is no ice left three years from now (a trend that bears out on the exponential graph below). Or, more hopefully, the stunning increase in losses over the past five years will abate due to some unforeseen inertia taking hold — perhaps Greenland providing a kind of fortress for the last of the sea ice. But given the stunning loss trends since 2007 and the added effect of increased sea ice fragility, there is a high likelihood, about 50%, that all the sea ice will be gone by 2018. The gravity of this prediction should be settling in at this point. I’m not predicting the chance of a summer shower here. I’m providing science-based threat analysis for an event that hasn’t happened in the past 2 million years being a coin toss away within six years. Some scientists are also making this assessment. Deniers, are you listening? What’s our best reasonable hope then? At some point, the 90% marker pops up and we don’t really have much reasonable expectation for sea ice to last beyond that point under the current conditions of human-caused global warming and Arctic ice melt trends. Currently, based on the best trends analysis, it’s about 90% likely that summertime Arctic sea ice will be all or mostly gone by 2035. At that point, the only potential source for sea ice comes from Greenland melt and we would hope that volumes of Greenland melt don’t rise to the point of emitting enough ice to temporarily re-grow the summer sea ice. And an end to Arctic sea ice year-round? Going back to the potential for events based on exponential trends, it is important to examine entirely what they indicate. What the exponential volume trends are showing is that all sea ice could be gone, year-round, by 2032. This means that in many of our lifetimes (20 years) there could be no Arctic sea ice left — at all. Back in 2007 these exponential trend graphs bearing out didn’t seem so likely. But, now, it appears that sea ice melt in the Arctic is an exponential, nonlinear event. The result is that it is much more likely that these trend models will serve as accurate future predictions. At this point, it appears far more likely, 25-35 percent perhaps, that amplifying feedbacks in the Arctic will result in ice free conditions for the Arctic Ocean, year-round, by the mid 2030s. And this is the sad legacy of 2012: the realization of an eminent end of Arctic summer sea ice within, at most, 20 years, and of a likely end to all Arctic sea ice during the first half of this century should human greenhouse gas emissions not abate dramatically and soon.